The sophisticated city Milan is the second largest city of Italy and a true magnet for tourists. And not without a reason! The city is most known for its fashion week, its magnificent church and (like any Italian city) its cuisine. 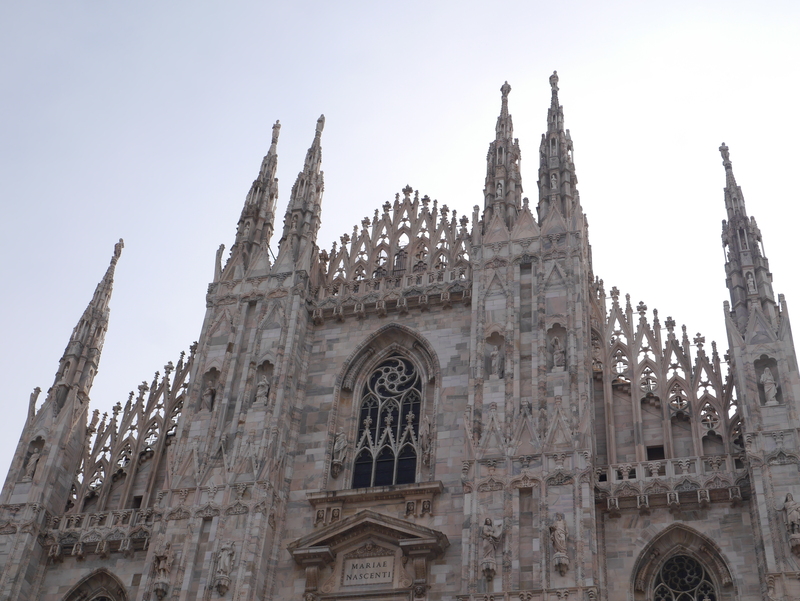 All I can say is: go, see, explore and let Milan enchant and inspire you! The most breathtaking moment of your trip to Milan will be the first time you set your eyes on Milan’s most beautiful landmark: Duomo di Milano. Walking up the stairs of the metro station Duomo, I couldn’t believe my eyes. After having seen the cathedral so many times on photos, I was astonished by its beauty in real life (both day and night!). What makes the church stand out are the 135 spires and pinnacles on top of the cathedral. Besides making the church look elegant in the eyes of a tourist, these spires also have a spiritual meaning by reaching upwards to heaven. Ater doing some research, I found out that these typical elements in Gothic architecture, are actually not just for the eye but are part of the architectural structure. Either way, for us amateurs, it makes the church an undeniable beauty! To enter the Duomo di Milano as well as its terraces you need to get tickets at the ticket office around the corner (admission to the cathedral €3; admisstion to the terraces €9 by foot and €13 by lift). Keep in mind, you need to cover shoulders and knees to enter any church in Italy. However, in case you forgot, they offer special capes at the ticket office. While Italy has a tremendous amount of reasons to visit the country, one of them is undeniably its cuisine. 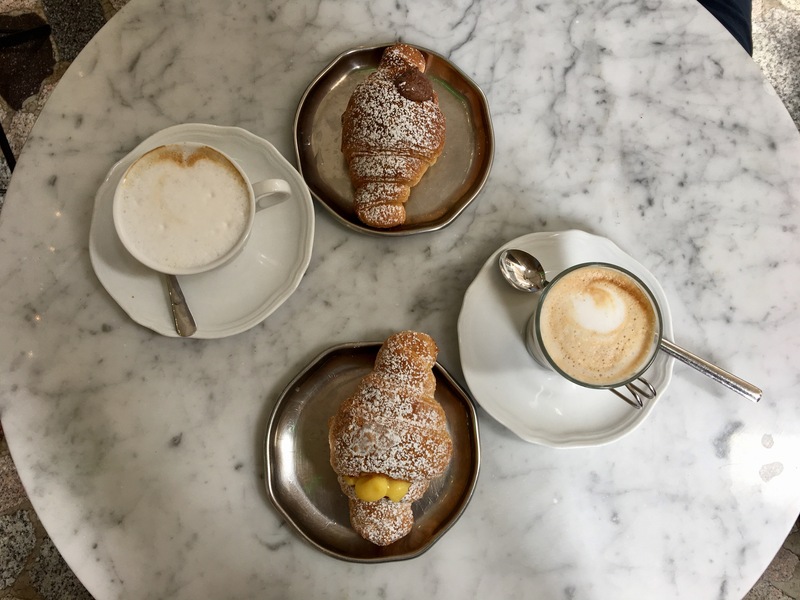 Whether it’s breakfast, lunch, dinner, snacks or drinks; Italy is a master in all. Start your day, just like the locals, with a cappuccino and sweet breakfast. Then, kill some time until noon, when you can enjoy a lovely, authenthic pizza (I mean, what’s better than pizza for lunch?). Afterwards, it’s time for gelato! Just a quick heads up: don’t be deceived when you see the cone of the piccolo gelato. While it may seem extremely tiny, the Italians have a gift to build a huge tower block of icecream on it! (But if you’re like me, and order the bigger option anyway, I’m sure you’ll finish it nonetheless. It’s just too damn good)! …aaaand it’s dinner time! A little voice in me is already singing: “pizza for lunch, pizza for dinner, pizza all day!” However, as you might know, there are also other delicious options, such as pasta, lasagna, rissotto and so on (it just seems unfair how many heavenly national dishes the Italians have)! Also, don’t forget to honor one very important Italian tradition: the aperitivo, a drink to warm up for dinner. Buon appetito! I hate to say I told you so, but… the Italian cuisine: not so bad, eh! I could definitely get used to the Italian lifestyle; enjoy some nice vino, have some authenthic Italian food while enjoying the warm summer evenings with some good company.. When you think of Milan, you think of fashion; when you think of fashion, you think of Milan. The city is internationally recognized as one of the most important fashion capitals together with Paris, London and NYC. In two weeks time, Milan’s fashion week is starting off again. However, just by walking through this city you already get a taste of its fashion scene. Located on the left of Duomo di Milano, is Galleria Vittorio Emanuele II; the world’s oldest shopping mall, build in the 19th century. Nowadays, the majestic building contains luxury retailers selling their haute couture and jewelry as well as restaurants and cafés that make up for a meeting point (fun fact: following a Milanese tradition, stepping on the bull’s balls that are portrayed in the galleria will bring good luck;)). Not to sound like a broken record, but the Galleria Vittorio Emanuele II is just another true Italian beauty (if only you had a creditcard!)! 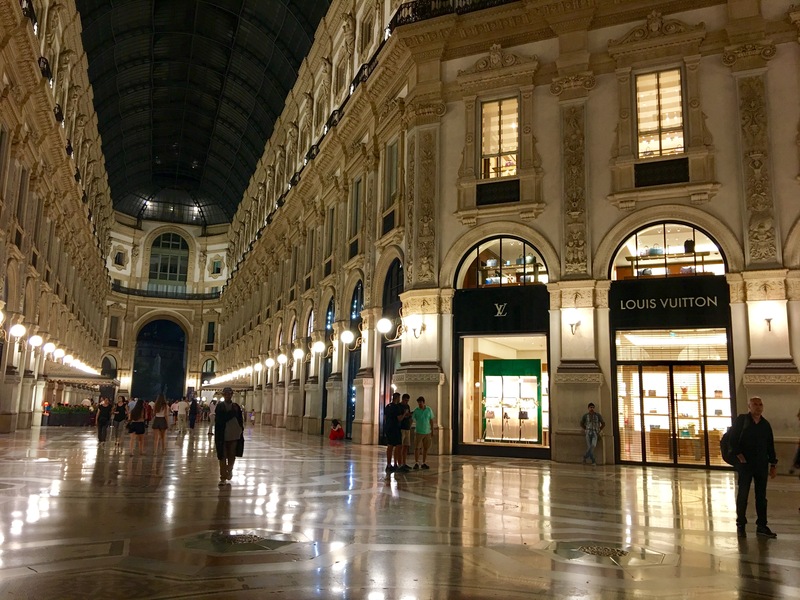 Since not everybody can live like a princess, head towards Corso Vittorio Emanuele II if you’re looking for more affordable shops. All good things come to an end… Soon, it’s time to head off to Venice! Have you ever been to Milan? What was your best experience? Did you step on the bull’s balls?